In our yoga asana study, we will focus on understanding the poses for their benefits, structure, and as vehicles to cultivate mindful awareness. We will study classical yoga asanas through intelligent sequencing and the use of props and modifications to accommodate a large range of abilities. This knowledge supports teaching students of all levels and is essential when teaching public yoga classes. During each day of the core sessions of the Dharma and Yoga Teacher Training, we will study anatomy through images, three-dimensional models, and experiential learning. This study is focused on gaining the anatomical understanding required to teach and practice asana in an informed way. Our Dharma sessions will emphasize the cultivation of mindful awareness and learning to embody these wisdom and heart practices in our daily lives. For homework, you will have daily practice guidelines and an in-depth manual that details all of the asanas to practice with. You will also have access to recordings of all training practice sessions to utilize in the periods between sessions. My website is a great resource for prospective students to get a feel for my teaching style through my writings and free audio classes. My primary teacher is Tias Little (also one of the Dharma and Yoga Training faculty), and our approaches are similar. Tias Little’s online classes can be viewed on YogaGlo and through his website, Prajna Yoga. Upon completion of this program, you will be certified through Yoga Alliance to teach at the 200-hour level. In this session, we address the foundational asanas with a focus on standing postures and the feet as the “foundation to the temple of the body.” This work is supported by the core teachings of the Buddha and Yoga Dharma. Our focus is on alignment-based asana and somatics training to increase sensory awareness and grounding the practice in mindfulness. Through lectures, images, and hands-on practice, we study the anatomy of the feet, legs, and pelvis for more effective asana practice and teaching. Anatomy study fosters internal, or mindful, awareness through deepening knowledge of the body and its structure. Central to this course is the training of the mind and heart. We connect with the triple gems of the Buddha (Awakened Mind), Dharma (the Teachings of the Buddha) and the Sangha (the community of practitioners). Our daily meditation includes the practices of Shamatha and Vipassana with the support of the Four Foundations of Mindfulness. The Four Noble Truths, the Eightfold Path, and the Ashtanga Yoga system are illuminated through readings of the traditional texts, poetry, and contemplation for an embodied connection to the Dharma. 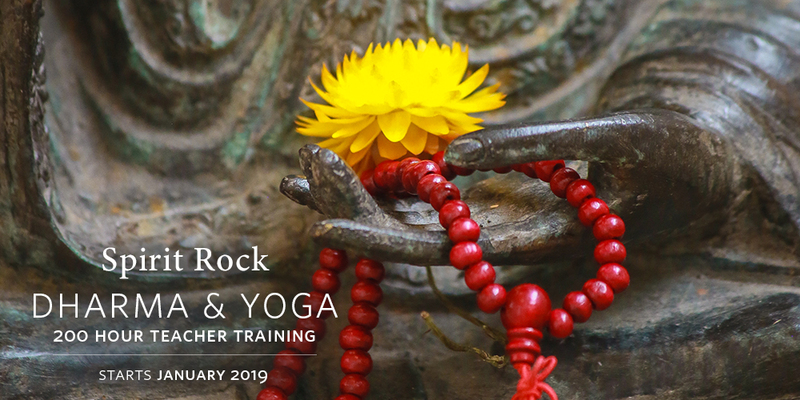 The emphasis of this course is on cultivating your deep connection to the teachings and your personal practice as the wellspring from which you share Mindful Yoga. Intimacy with the breath is central to this session. We explore the anatomy of the torso, hands, arms, and shoulder girdle as gateways into the upper torso. We detail the structure and function of the diaphragm, lungs, heart, and kidney/adrenal complex in relation to the breath. Through asana sequencing, students learn how to stabilize and open the shoulder girdle and upper chest. The asana sessions include arm balance, inversion, backbends, and practices to restore the organic body. Pranayama or breath practice is taught as “the art of listening,” cultivating an intimate relationship with the breath and viewing the breath as the vehicle for insight into mental and emotional wellbeing. This session gives insight into the emotional and subtle body. This is essential to yoga practice and teaching, as our held tensions and beliefs are stored in our tissues and nervous system and affect our deep biorhythms and well-being. We study the neck, jaw, and cranium, and yogic and meditative practices to release physical strain as well as psychological tensions. Our anatomical study illuminates the delicate structures of the throat and jaw. We look at how proper alignment of the skull brings balance to the entire system both in asana and sitting meditation. In addition, we address the nervous system and the triune brain with the aim of calming the habitual stress response. Through inversions, supported asanas, somatic practices, and chanting we learn to pacify the nervous system. This facilitates a spacious mind, the possibility of insight, and heart opening. We highlight pratyahara, or tending to the senses, through working with the eyes and tongue, deep inner listening, and tracking internal sensations. By pacifying the senses we enable the inner journey. The meditation practice highlights mindfulness of emotions as well as the Five Hindrances. We study the Brahma Viharas as powerful means for connection to Buddha nature and the antidote to stress, psychic pain, and anxiety. In this course, students further their skills in offering mindful yoga with clarity and confidence. We cover class planning and sequencing, prop use to support all bodies, demonstration, and directing students’ awareness to their internal experience rather than the achievement of a pose. Additionally, we focus on how the use of language, silence, voice tone, and word choice strengthens mindful awareness when teaching yoga.